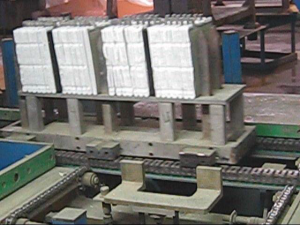 GRIDS PRODUCTION They should be in lead-calcium alloys to reduce water consumption. For this reason, the lead must be of first melting, not recycled. The same applies to oxide production. ENVELOPER, STACKER Our enveloper can work with the thick separator in glass matt and, after the enveloping of the plate, it can prepare the groups following the recipe on quantity of positive and negative plates per group. After the groups preparation, there is a verticalisation station where the groups are displayed on a chain, which is also the feeding chain for the COS. What is important for the correct production of the groups is the quality of alignment between positive and negative plates, the tinning of the lugs, and the compression group for the right production of gases inside the battery. This is why our process is so well engineered and performed. This line constantly checks the parameters to be simply adjustable, with no production stops or losses. We made it real, with solid and reliable stations, in order to maintain the quality through all assembly phases, all shift long and for all shifts, and it lasts for years! COS AND BOXING On the COS station we perform the correct operation process with the best quality you can find on the market. The automatic COS feeding station brings the groups well prepared and aligned, and it compresses them to keep the plates correctly in position, and makes the straps on the mould. The correct tinning of the lugs and the right temperature of the pot feeding pipe and mould allow a top quality strap production and the minimal dross production for a continuous high quality lead strap. 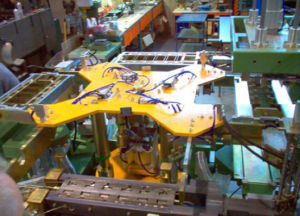 After strap making, the automatic feeding arm takes the groups and place them on the compression unit to be eventually inserted in the box with no scratches or bad positioning. A note on the electro-welding station. As the alloy lead-tin is quite soft, the straps must have a proper temperature. For this reason, we cool them down with the related device. Also the use of ABS boxes needs a trick on the welding station. 1.ENVELOPPING AND STACKING UNIT Workable plates: Sizes: width from 125 up to 115; height from 180 up to 250; Thickness from 1.5 to 4.5 mm Number of plate handled/ per minute: 50 Maximum thickness of the plates group : approx. 170 mm Plates group composition: by electric control panel. 3. COS + Electric control panel The machine consists of the following parts: -load/unload unit; brushing and fluxing unit; tinning unit; straps casting managed by a PLC Siemens S7and by an Operator Control panel OP17.